During distal biceps tendon repair, Dr. Patel makes a small incision over the upper forearm, where the biceps muscle attaches to the radius bone. The torn biceps tendon is brought up through the incision. Then, a socket is created in the radius bone for tendon reattachment and to promote healing. 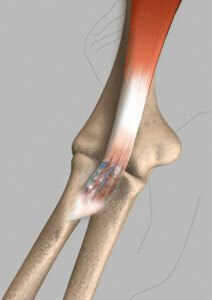 The tendon will be inserted into the bone. A button and screw will serve as anchorage for the tendon. After the repair is complete, a hinged elbow brace will be applied with your elbow bent at 90 degrees. The brace will be removed after 6 weeks and it may take up to 4-6 months to regain full strength.